at Justin Herman Plaza across the street from the Ferry Building at Embarcadero. 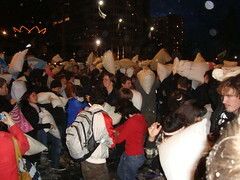 On Valentine’s Day 2009, couples and singles (and I guess triples) alike joined in the largest, fluffiest, most insane pillow fight I’d ever seen - the Great San Francisco Pillow Fight 2009. Besides, what better way to say those three little words than with constant beatings in the face with a large rectangular mass of feathers. Unfortunately, being the tree-hugger I am I decided not to participate in the actual fight because all of my pillows were of the polyester or memory-foam type. Neither of which are as earth-friendly as feathers strewn about the ground. Nonetheless, I had a great time watching others enjoy the random acts of violence across the park. To give perspective on the sheer number of pillow soldiers there, at a few points during the night I do a 360 with my video-cam setting and all you can see are pillows and feathers flying in all corners of the park. By my estimates, there were 5 kajillion people there - give or take a few kajillion. For videos and more pics of the fight check the flickr. in search of all of its eccentricities including its random plaques, emergency fire hose outlets, streetlight control boxes, locksmith signs and sidewalk graffitti. As random as these items all may seem, a rhyme did in fact play along with the reason we had to find each and every artifact. Learn to play the guitar - I’ve recently begun weekly guitar lessons with a hippie-ish mandolin/guitar player who lives in the MIssion district. I can now successfully play “This Land is our Land” and strum the chords for “Green Day’s - Good Riddance”. If you forget to blog about it, who’s going to know it ever happened? I admit I’ve neglected this blog for the past couple weeks. I apologize to anyone who still reads this and especially Jody, who was the first from the Virginians to keep this lonely expat entertained for an entire weekend. would probably be the best way to describe last weekend - which started with my very first visitor. The first, I hope, of many.